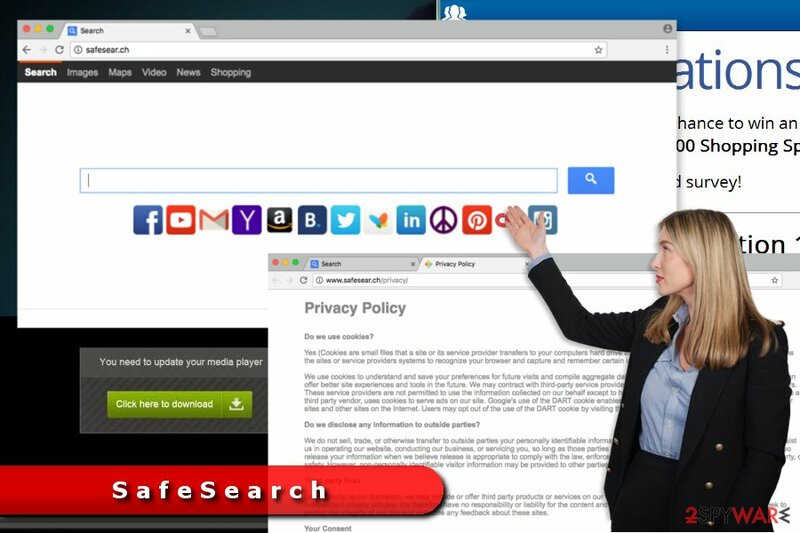 SafeSearch is the PUP that uses misleading techniques to prevent removal. Use Reimage to locate malicious components and get rid of them faster than with uninstall instructions. A full system scan blocks virus reappearance and prevents traffic to malicious domains. SafeSear.ch is a search engine that provides fake results filled with sponsored links. SafeSearch is a group fake search engines that have been making rounds since 2014. Due to frustrating behavior or absence of certain elements, they have been classified as browser hijackers. The dubious app can be downloaded from the Chrome store, as well as a SafeSearch Incognito extension. However, users will find SafeSear.ch as their homepage after they download free software from the internet – this distribution method is called software bundling. Recently, the name of this hijacker returned to the headlines because of Google that presented the protection feature called SafeSearch. With its help, users can prevent the explicit content appearing in their searches. In some countries, for example Indonesia, this option is enforced by law. While potentially unwanted programs are not considered to be malware, the presence on the computer might compromise its safety. Nevertheless, without knowing about it, users might be lured by quick access buttons to Amazon, Twitter, Gmail, YouTube and other popular sites. However, bookmarks can be created in just a few seconds for the desired sites; thus, there is no need to use questionable search engines like SafeSearch. The first task Safesear.ch hijacker does on the targeted device is system modifications. It might alter Windows Registry and various shortcuts to prevent people from taking back control over the browser. Then it changes current startup page and search engine to its domain. SafeSearch virus is mostly used for promoting third-party websites and increasing their sales or page rank on Google. However, you can hardly know how trustworthy these websites are because the developer of this hijacker fails to guarantee their trustworthiness. As a result, you can find another PUP or even virus on your computer. 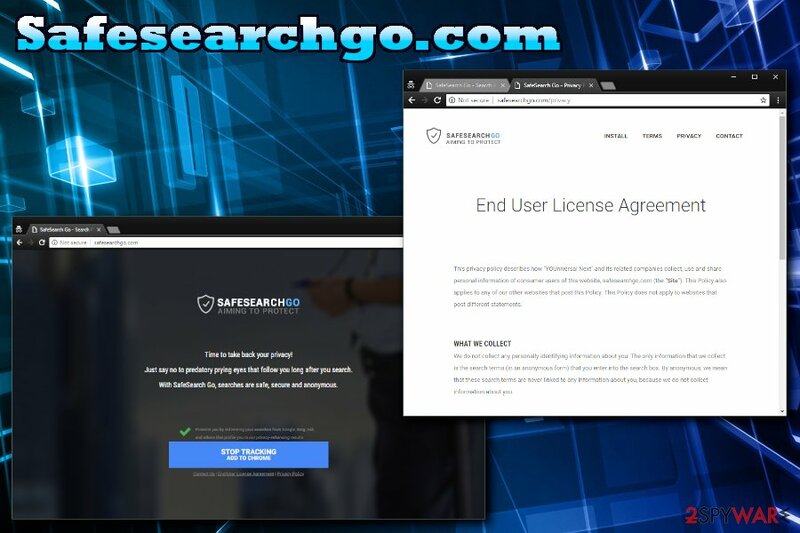 Besides, SafeSearch search engine may also block the access to some of your Internet resources without your permission asked and then cause unexpected advertisements or pop-ups with commercial or pornographic content. The most disturbing fact which is related to SafeSear.ch is that it can track its victims. Just like a typical browser hijacker, it collects users' search terms, information about most visited websites, and similar information which is related to browser habits. However, we cannot guarantee that this hijacker is not capable of tracking personal information as well. SafeSearch redirect virus is designed to alter browser's settings and set its domain as default search engine. SafeSearch does not perform its primary function properly. It might alter search results in order to include sponsored links at the top of the results page. Therefore, it might take a while to find useful and reliable information. What is more, SafeSearch removal can help to protect your computer from cyber threats. Some of the content provided by this search provider lead to potentially dangerous sites. Thus, you might get infected with Trojan, malware or suffer from other cyber crime. 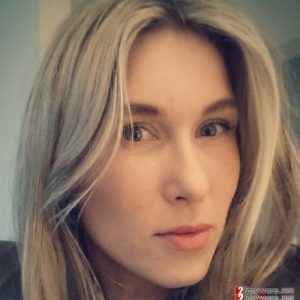 You can remove SafeSear.ch from your computer with the help of Reimage. As an alternative, we suggest you scroll down and check the manual removal guide which was designed by 2-spyware.com researchers. However, if you are not an experienced PC user, you should select the first option. On July 2017, researchers noticed a new distribution method of the SafeSearch. 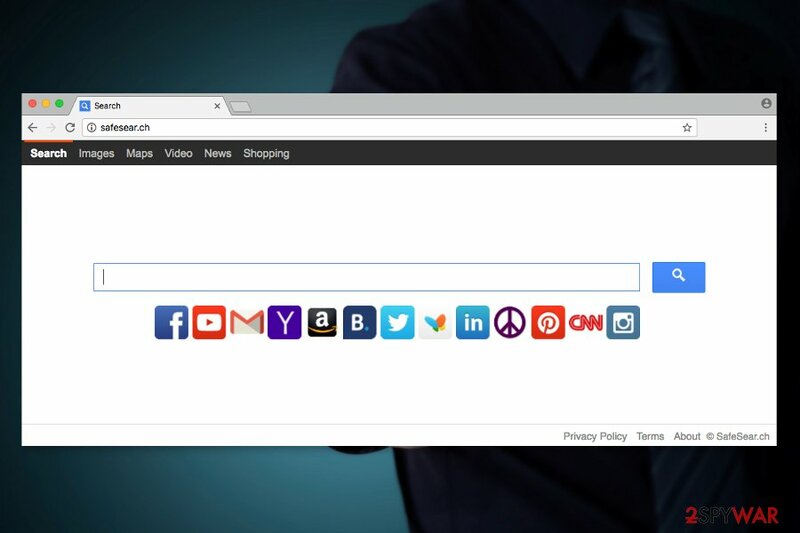 This bogus search engine becomes a default after the installation of SafeSearch Incognito browser extension. It is available on Chrome web store and is compatible with both Windows and Mac OS X.
Browse and search privately, without sharing personally identifiable information. and the webpage that a user visits. Therefore, you should not be tricked by the beautifully written description of the browser extension. If it managed to sneak inside your computer with a software bundle and hijacked your browser, you should get rid of it immediately. Undoubtedly, the best way to remove Safe.Search.Tools is to use reputable security software. SafeSearch.top virus. SafeSearch.top claims to be a provider of “Advanced & Clean Search,” however, its functionality proves that this statement is wrong. Cyber security experts tend to rate this search site and the program that promotes it as a browser hijacker and a potentially unwanted program. The site is written in Hebrew language and provides links to external sites of unknown reputation. SafeSearch.top is a variant of the PUP and is designed for Israel-based users. 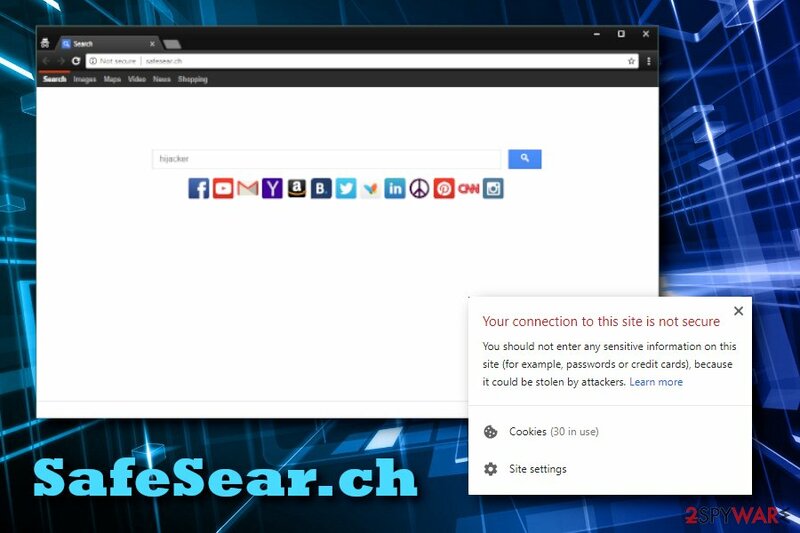 If you do not speak the said language and you did not set the said search site as your homepage, but the search site emerged in your browser anyway, remove SafeSearch.top hijacker instantly. You can use the instructions we provided on rely on security programs we recommend using. Safesearchgo.com or (alternatively known as Google is Tracking Your Searches). This particular version is promoted as a browser plug-in supposedly enabling you to browse safely. It is not recommended to use this add-on as it is promoted in a random web page – safesearchgo.com/campaign/?pid=buck_safe203&src=75_ADC_Pub_Id&utm_source=. It is recommended to cease this Safesearchgo redirect. If, by any chance, you are interested in it, note that this group of hijackers is closely associated with the AdNetworkPerformance adware. SafeSearch products are promoted in random and insecure pop-up ads. It is another argument why it is not advised to use any of their tools. Besides installing useless plug-ins, you may accidentally get redirected to an infected website. Another version of the virus prompts users to download useless browser extension, allegedly helping to stay secure online. This PUP spreads using questionable and doubtful methods. One of such methods is known as “bundling.” Beware that you can end up with unwanted system changes and similar problems after installing freeware and shareware without monitoring its installation process. To stay safe and prevent infiltration of such problems as the SafeSear.ch redirect to sponsored websites; you should start checking what programs you use. Please, avoid questionable, illegal and suspicious programs. If you decide to install a free program from the Internet and think that it is safe, select Custom or Advanced installation method. After that, follow every installation step of the freeware and opt out of such potentially unwanted programs like this one. You need to uncheck all checkboxes that offer you to change your start page and default search engine because this may easily allow installation of SafeSearch. A new variant of the hijacker, known as Safe.Search.Tools virus, has been noticed spreading via Chrome web store as well. We highly recommend staying away from SafeSearch Incognito Chrome extension. Keep in mind that other extensions might distribute this cyber threat too. Thus, always do your research before installing them. To avoid dangerous programs or even viruses on your computer, you should act now and remove SafeSearch. For that, you can use updated anti-spyware software or a guide given below. The hijacker mostly attacks French computer users; thus, if you are one of them you can visit our colleague’s site for more information. If you prefer to get rid of the Safe Search virus manually, you have to uninstall unknown programs and browser extensions. Make sure that you delete all hijacker-related entries. Leaving some entries on the system may lead to the re-hijacked browser. Chrome warns users that SafeSear.ch site is not secure to use. If you want to avoid failure and speed up elimination process, you should opt for automatic SafeSearch removal. As we have mentioned, you can do it with the help of updated security software. Just run a system scan and wait until the program finishes the task. To remove SafeSearch virus from the system and avoid its appearance on it in the future, you must remove every program which is related to it. You need to try to find SafeSearch, SafeSearch Toolbar, SafeSear.ch, Trovi, Music Search App, Genieo, and SafeSearch Incognito. Here, look for SafeSearch or any other recently installed suspicious programs. If this program hijacked your device, please follow the steps to get rid of it. Wait until you see Applications folder and look for SafeSearch or any other suspicious programs on it. Now right click on every of such entries and select Move to Trash. The hijacker may have altered settings of Internet Explorer. Follow the steps to get rid of all the changes caused by the hijacker. When in the new window, check Delete personal settings and select Reset again to complete SafeSearch removal. After the hijack, you have to follow the instructions and fix Microsoft Edge. Once these steps are finished, SafeSearch should be removed from your Microsoft Edge browser. In order to uninstall SafeSearch virus from Firefox, you need to remove questionable extensions and reset the browser. Here, select SafeSearch and other questionable plugins. Click Remove to delete these entries. Now you will see Reset Firefox to its default state message with Reset Firefox button. Click this button for several times and complete SafeSearch removal. To fix Google Chrome and SafeSearch infiltration, you should remove all add-ons that are related to this hijacker. 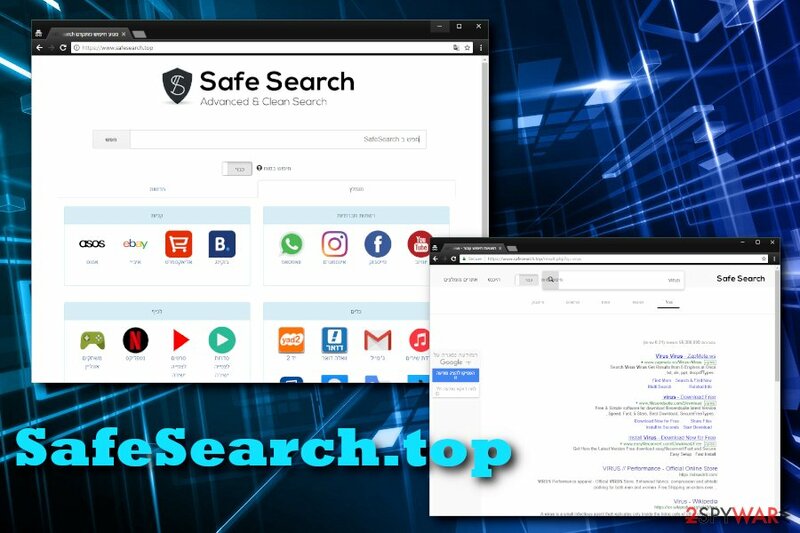 2-spyware security researchers found these apps to be related to this hijacker: SafeSearch, SafeSearch Toolbar, SafeSear.ch, SafeSearch.top, Trovi, Music Search App, Genieo and SafeSearch Incognito. Once you find an add-on which belongs to the same developer, make sure you delete it. Here, select SafeSearch and other malicious plugins and select trash icon to delete these entries. Click Reset to confirm this action and complete SafeSearch removal. These guidelines will help you to get rid of all hijacker-related components and set your preferred startup page/search engine on Safari. Here, select Extensions and look for SafeSearch or other suspicious entries. Click on the Uninstall button to get rid each of them. Here, look at the Homepage field. If it was altered by SafeSearch, remove unwanted link and enter the one that you want to use for your searches. Remember to include the "http://" before typing in the address of the page. Now you will see a detailed dialog window filled with reset options. All of those options are usually checked, but you can specify which of them you want to reset. Click the Reset button to complete SafeSearch removal process. ^ Everything You Need to Know about Tracking Cookies. SaferVPN Blog. The official blog by VPN provider. ^ Dan Price. The 7 Types of Computer Viruses to Watch Out For & What They Do. MakeUseOf. The site about modern tech and gadgets. ^ Tim Parker. 6 Ways To Protect Yourself Against Cybercrime. Investopedia. Financial content, investing news, market news, education, and free dictionary . ^ What are cookies?. BBC, WebWise. ^ LesVirus. LesVirus. Frech site about cyber infections, malware and virus removal guidelines. This entry was posted on 2019-04-01 at 00:07 and is filed under Stealing programs, Viruses. You can quickly scan the QR code with your mobile device and have SafeSearch manual removal instructions right in your pocket. How did you remove SafeSearch?